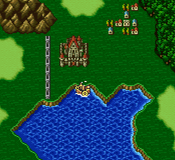 After preparing, enter the Fire-Powered Ship and talk to Cid. He’ll hurry you along your way after you’ve agreed to help him. Follow the stairs down until you reach the extremely technical looking bowels of the ship. This is where the fun (and all of the monsters) begins. The ship is not host to a vast assortment of monsters, but there are a couple important ones. The Crew Dusts (which were mentioned by a guy in Karnak) are dominant. They are nasty little ghosts. Try to kill them at the same time. If you leave one by itself, it casts Flash. This is probably your best opportunity to learn it. You could have learned it back on North Mountain, but not without shelling out an Ether to a Headstone, and Ethers were scarce back then. Bring plenty Eye Drops or wear Silver Specs to protect against blindness. After beating up on some of the monsters a couple Motor Traps may descend from the ceiling. They are weak to Lightning, however if you cast a Thunder spell on them they will Self-Destruct. The good thing about learning this spell is that you don’t have to live through it to learn it. Someone has to be left standing or its game over, but the poor sap with Learning can be dead at the end of the fight. Incidentally, if you have a Mystic Knight enchant his blade with Thundara it takes the Motor Traps out in one hit without inciting their retaliation. In this metallic room, you may notice a couple doors and stairways and even—hidden among the pipes and wires—an inviting treasure chest. Enter the first pod-like door to collect a Mythril Glove. After returning to the main room, head left and climb the stairs leading to the second floor. Try not to get dizzy as you notice the long drop down to the room you were just in. Walk all the way to the right. Enter the pod door and jimmy the treasure chest to gain an Elixir. Then go all the way back again and don’t worry about the visible treasure chest to the north. We’ll get to that. Walk north to the treasure chest and pick up a Cottage. Continue on your way northeast, but don’t enter the northern door. That takes you to the next area, and we have one more treasure stop to make. Take the stairs going down to get another Elixir. Don’t worry about the weird lever/elevator contraption. You can’t do anything with it at this point. Go back out and now you can head through the north door. This takes you to the first of many elevators. Pull the red lever to activate the lift to send you on your way. The elevator takes you to the second floor. The treasure chest to your right is the same one that eluded you earlier. It only contains a Phoenix Down, which seems extremely insignificant now that you have the Raise spell. The only place to go is north. Enter the door and take yet another elevator. Here’s where things may get a little confusing. There are giant pipes, conveyor belts and all sorts of places you can’t get to. For now, just take the stairs up and to the left leading to the hollow pipe. Walk through it until your reach a stairway. Continue through the adjoining room. You end up back where you started. Only now you’re in the bottom left corner. All you can do is go through the door, so by all means enter. Ride the elevator to the next section, a confusing mass of doors and pipes. Enter the top middle door. After another exciting elevator ride you’ll be back in the top part of section three staring at a tantalizing treasure chest that is separated by another darn conveyor belt. Take the pipe on the right. Follow it through the familiar room with all the doors and pipes and you arrive back at section three directly in front of the treasure chest. Isn’t that convenient? Collect your Green Beret (I’m not sure if you should feel French or Military wearing it). And take the conveyor back to the elevator, back to the many-door, many-pipe room. If you are inclined, you may take the top right door. However, it leads to a dead end with nothing interesting but another backwards conveyor belt. Similarly the bottom right pipe drops you right where the top middle door leads. So if you’ve already gotten the Green Beret, disregard this pipe. Finally the second pipe from the right will drop you down to that treasure in section three that taunted you from across the conveyor belt. Unlock the chest and behold the rare and wonderful Thief’s Gloves. Then take the pipe back to the room-of-many-doors. Skip to the far left pipe. This one also drops you off in someplace you’ve already visited—the bottom left side of section three. There’s nothing to see here. When you’re ready to continue on in the ship, enter the second pipe from the left. The conveyor’s drop you off in the bottom right of section three. You’re confronted with a choice, the door or the stairs? Take the stairs. They lead you back into the room with the red lever you couldn’t access before. Pull the lever. This opens the door to a treasure room. Here you receive the Moonring Blade, a lovely weapon for a thief. The Moonring Blade does the same damage from the back row, so you take less damage. Now you’re free to traverse the halls whence you came and this time choose the door to continue further on your quest. Walk through another room you’ve already visited from another angle (déjà vu?). Save in the next room at the strategically placed consecrated circle. Feel free to use that Cottage that you got way back in the beginning. The next room can be a bit tricky. It’s full of elevators and levers. Begin by walking onto the nearest elevator and pulling the red lever to the left. This takes you to the platform to the north. Proceed to the top of the screen and pull those levers. The small elevator south of the treasure chest will shift to the right. Now head directly south of the levers you just pulled and to the left. Pull the lever to extend another platform all the way across the center of the room. Follow it all the way across. Pull the levers nearest to you to retract the platform you just crossed. Pull the levers next to the wall to bridge the gap between the middle and bottom platforms. If you need to get back to the beginning of the room, to heal or save, step on the left platform and pull the lever. Mind you this is a one-way trip. You will have to go through the lever pulling again to get back to this point. To continue on towards the exit stand on the upper platform and pull the lever. You will sail to the top of the screen where you should be able to reach a treasure chest housing a final Elixir. After collecting the treasure go through the pod door to reach the final room and the boss. Obviously, being made of fire and all, this boss is weak to ice. Therefore it is safe to assume that he absorbs fire attacks. In fact, he likes to heal himself with his own fire spells, which is rather cunning of him. A lesser-known fact about Liquid Flame is that he absorbs wind magic. I suppose this makes sense considering air fuels fire. This is another battle that I like to fight with mostly mages. I like to take full advantage of my foe’s weakness. All black mages get rather dull. I spice things up by incorporating a mystic knight with a Blizzara enchanted sword and white magic, a summoner equipped with Shiva and white magic, a black mage with white magic, and a white mage with black magic. I’m a bit obsessed with healing. And for a little extra wallop on your ice spells, make sure your summoner and black mage are wielding Frost Rods. Also note that none of the three forms carries anything to steal. Don’t bother bringing a thief into the fray. The boss has three distinct forms. The first is that of a man. He has two main attacks in this form. Blaze, which scorches all party members and Rush which is a physical attack to a single target. The second form is that of a hand. This form is a bit more challenging than the man form because it is immune to spells. Considering the makeup of my party this made hitting the hand nigh impossible. Eventually I resorted to summoning a Chocobo or Sylph to do a small amount of non-elemental damage so it would change forms again. For this reason you might wish to use a regular knight or some other physical fighter instead of a pure elemental team. The hand fortunately doesn’t do much damage. He uses an attack called Ray to paralyze a single target for a short period of time. He also casts Fira to single targets. Failing that he just attacks. The third form is a tornado type creature—maybe a firestorm? This incarnation likes to heal itself using Fira. It also uses a Magnet attack to change the rows of your party members. This shouldn’t pose much of a threat to your spell-casters. The item you win is dependant upon what form the monster was in when you killed him. For the man you receive a Flame Scroll. If you kill it in hand form you receive a Flame Rod. And if you snuff it in firestorm form you will get a Flame Bow. Try and time the killing blow to obtain the item of your choice. After defeating Liquid Flame, the queen comes out of her trance and instructs you to save the crystal. Before rushing off to save the crystal, take a look at what’s in store for you in Karnak Castle and change your Jobs and Abilities accordingly. You won’t have another chance to do this before the clock starts counting down. Make sure you have someone with learning so you can learn Death Claw from Iron Claw. When you are ready, proceed north through the long pipe to reach the Fire Crystal. As lame as Time Mages may seem, having one for the battle with Liquid Flame is a good idea. The level 2 Gravity spell halves the boss' HP. If you can hit the boss with it twice, Liquid Flame is reduced to a quarter of its original HP. to defeat the Liquid Flame, you must get Shiva in the Castle Wasle first. set Galuf in the Summoner class and choose the Black command as the second command. the same with Lenna but choose the white command as the second option for her. then set Bartz and Faris into the Mystic Knight class. use the Spellblade Blizzara several times. Mottletraps also cast Missile if you control them. Mottletrap will teach for you blue magic spell exploder,if you use lighting elemental magic against them.